We’re playing the MOTU catch-up game this week in order to get through the box full of figures that Matty shipped us for June. 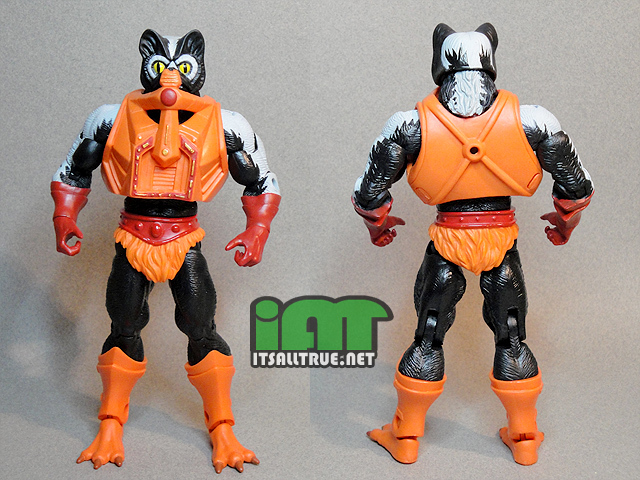 So before we dig into those goodies, I need to get the last May figure out of the way: Stinkor! 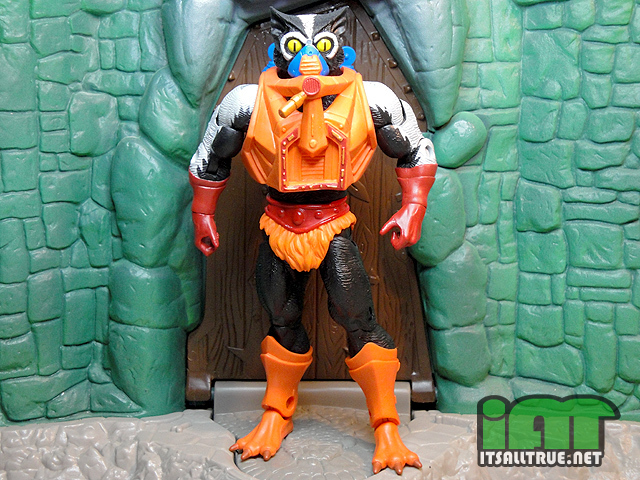 I never had Stinkor as a kid, and really didn’t want him. Being young and naïve, I thought the figure would actually smell like a skunk, rotting garbage, or something equally as disgusting. My imagination had no bounds and I couldn’t understand why anyone would want that in their house. As an adult collector, I was actually really looking forward to Stinkor’s figure. Even though it was scented with the same smelly patchouli oil, I could learn to live with it because Stinkor was going to be one of those rare MOTU Classics figures that could double as a representation of both the Vintage and 200X lines. Those definitely tend to be some of my favorite figures in the line. We all know a big part of MOTU is the reuse of body parts, and aside from Draego-Man, Stinkor here is probably one of the best examples of how that can turn out great. 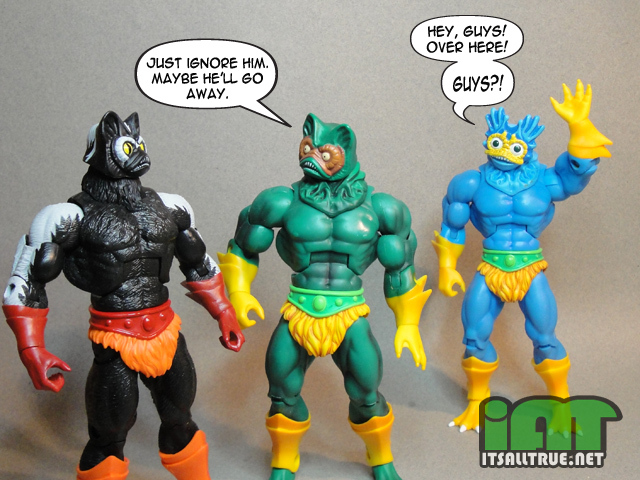 Like the original figure, the Four Horsemen used Merman as the base for Stinkor’s looks. But they improved on the original figure by making proper tweaks, like giving him the furry body. They even added a new furry neck piece to replace Merman’s amphibian neck. But what really makes this figure shine are all the alternate pieces that he comes with. I’m a big fan of both Vintage and 200X, but I tend to side with the design that gives the character a more unique look. The MO2K inspired head is an all new sculpt with bulging eyes and a vicious looking mouth. I never realized it before, but this version of Stinkor doesn’t have a nose. I remember Stinkor warming the pegs alongside Kang from Secret Wars for obvious reasons. I was curious as to how bad the smell really was, but never enough to crack one open back when there were rows upon rows of Stinkors, all “ripe” for the picking. I’m glad that Mattel got around to releasing him in the Classics line. I’m a huge Mer-Man fan, so Stinkor here is sort of like his long lost cousin to me. Great review and pics, as always! Loved the penultimate shot with the three different head versions. And I agree with you on the lack of metallics on the blue bits. I’m tempted to correct this issue, but I’m also worried that the paint will come off and marr anything it comes into contact with. I’ve got sealants, of course, but the gloss coat is even more likely to stick to items like the Man-E weapons. I think I’ll wait until I have proper display space for the MOTUC collection before I fix Stinkor’s armoury. 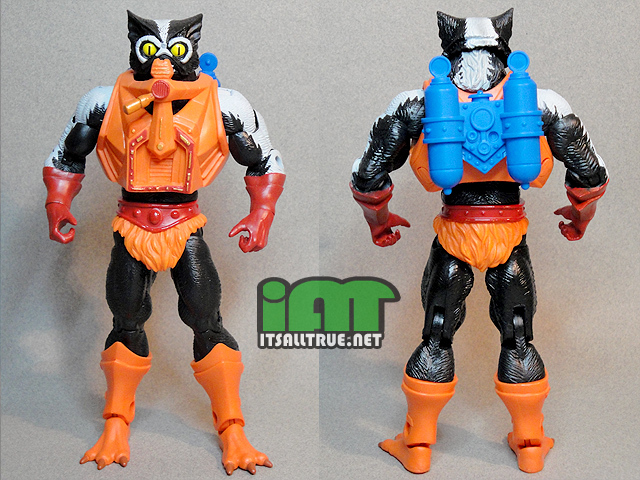 Also, I find that the new Stinkor doesn’t reek as strongly as the vintage one. The original, if he was upstairs at our old house, I could smell him downstairs. At least, I could until his aroma started to fade after a couple of years. Which is why he spent most of his time packed back into his bubble, in the bottom of the Rubbermaid container I kept my MOTU figures in. This new Stinkor, I can only really smell him if he’s right up against my face. And compared to the old Stinkor, that’s a good thing. Not to sure about the sharp-edged pupils on the Millennial head, though. Looks a bit weird. And does anyone else have a problem with getting his blue face-mask to stay on? Is it just a case of having to put it in hot water until it melts back into shape, or is it a flaw in the design? I like the rectangular pupils. It makes him look like he just got completely blitzed on his latest chemical concoction. The idea that Stinkor is walking around Snake Mountain loaded with psychotropic hallucinogens is hilarious. I too have trouble keeping the gas mask on. On one hand its a bummer, on the other I think it’s a shame to cover up that awesome furry face sculpt. I have trouble with keeping that little blue mask in place too, Beedo. It might just need tightening up in water but I haven’t tried yet. The trouble with switching the forearms of course are his white stripes – they’ll swap from the outside to the inside of his lower arms. But I’m mostly okay with his odd, tumorous bulges – sticking to a MO2K origin, he is after all a hideous mutant. Well, I’ll give the hot-water thing a go, anyway. Thanks. And as soon as I read “white stripes” in your post, I got “Seven Nation Army” stuck in my head, with visions of Mutant Skeleton Warriors and Scareglows marching to Evil Lyn’s drumming. OK, I need some clarification here, Vault. You casually mention swapping the forearms, and I see in the ‘Mer-Man Roll Call’ pic that Stinkor indeed has his forearms different, but is this a flaw (good old Matty QC on the job!) or is it just a visual preference? I disagree. If you’ve already weathered the same storm twice before, then is a 3rd time really a big deal? It’s not like that explanation would quiet the .orger’s any ways. I think he looks good, so I don’t really care about the wherefores and whatnots. twice? they’ve weathered it three times on the shoulders alone (he-man, roboto, king hsss) each of those saw the fanbase get louder as they went…. and they’re about to ask us to pay more money for next year’s sub. you can disagree all you like, because it’s a theory, but the theory is valid and internally logical. no business wants a hullabaloo right before opt-in for a very expensive subscription service. Well, I’ll come on board with this on one condition: Did they state that it was a design choice by the 4H, or did they state it as generic ‘we’? No, they didn’t blame the 4H this time. The silliest part of the whole thing is that they even sculpted new arm parts to have the consistent fur across the arm. So they indiscriminately assembled new parts backwards. Well, it makes the guy look a bit different, and quite honestly, I never noticed any “anatomical irregularities” even after people kept saying the forearms were swapped. I can’t see what the big, fat, hairy deal is . . . and I’m an OCD geek on par with Sheldon Cooper. It’s the big, fat, hairy tumors on his outer arms. Nope, still not seeing it. I mean, all these muscle-guys are lumpy all over, anyway, and most of the exposed forearm is taken up with the gaping wells for the hinge joints. If you still can’t see it after seeing clearly in the Mer-Man pics how Stinkor’s musculature should look like, then there’s no convincing you. Nope. Mountains out of molehills, as far as I’m concerned. Banks are screwing over the people of the world, we’re headed for environmental meltdown because there are too many humans on this planet, and people are more worried about mimicking Reality TV “stars'” looks than their own kids’ educations. One pair of weird-looking forearms on a toy doesn’t deserve this much ire. He’s freakishly mutated; there’s your explanation. Don’t worry; be happy. With Mattel botching the arms and removing key paint ops, this guy became an easy pass, especially considering how awesome the Staction version is. And every time I see more pics, I just think how silly it is to have two heads with this guy. He would’ve been more than fine with just the modern head. i know diehard nostagites will disagree, but considering how similar they are, just go with the better more original, more villainous look and save the 2nd head slot for something way cooler. Does Tee- la have the same forearms problem as Stinkor? No, her arms were assembled correctly. Stinkor’s are not.